Last month, we hosted an intimate Space on the Cloud event for a room full of researchers from local universities, data scientists, and other experts in Singapore. Customers and thought leaders from the Earth and space community joined to discuss how they are unearthing new discoveries through cloud technology. Session titles included, Evolutionalize Earth Science Data Analysis on the Cloud — Improving Lives and Safeguarding our Future, HopeSat-1: NewSpace for Education, and much more. It offered a window into the role of cloud computing in scientific discovery, and how the cloud can improve lives and safeguard our future. This included a look at how the Philippines Atmospheric, Geophysical and Astronomical Services Administration’s website uses NASA’s open-source data to provide life-saving weather and natural disaster information for citizens. Our featured speaker was Hook Hua, a data scientist from NASA Jet Propulsion Laboratory. He showcased the Advanced Rapid Imaging and Analysis (ARIA) project hosted on AWS, as well as other cloud-powered NASA missions. Attendees benefitted from tips for building planetary-scale applications in the cloud with big data analytics. 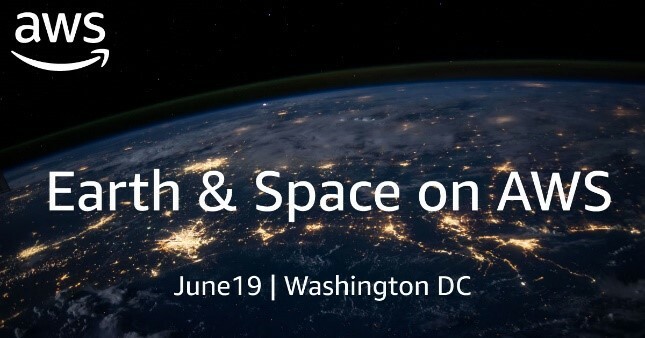 If the great unknowns of Earth and our solar system pique your curiosity, there will be plenty for you to learn at Earth & Space on AWS, a day before our AWS Public Sector Summit. Take a listen to our recent podcast episode to whet your appetite further, and be sure to join us this month.